The Decimal Suite enables you to generate realistic forecasts and scenarios based on cost behaviour and cause-effect relationships. Forecasts and scenarios typically involve adjusting resource costs and the sale price of goods and services. The Decimal Suite enables users to quickly and easily calculate the impact of cost adjustments. Adjusting costs and sale prices are only one aspect of this exercise. A truly realistic forecast should also take into account the demand for goods and services and the organization’s ability to meet that demand. With the Decimal Suite, users can enter a demand for products and services and then calculate the volume of activities required to meet that demand. Then, the tool calculates the resources (labour and other expenses) required to sustain the previously calculated volume of activity. 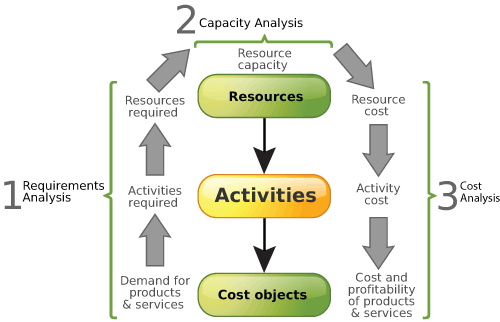 By parametrizing capacity, managers can immediately ascertain whether or not the organization has the necessary capacity to meet the demand for products and services. This means managers will no longer pursue unrealistic scenarios. First, he or she could increase efficiency: if a given activity enables workers to process 15 requests per hour, the manager could decide to set a goal of increasing efficiency by processing 20 requests per hour. Second, the manager could increase the processing capacity by hiring additional labour, for example. Third, the manager could choose to reduce production to a level that is realistic for the organization. Because it factors in capacity, the Decimal Suite provides reassurance that scenarios are consistent. It also enables managers to rapidly change parameters and save as many scenarios as desired.